This blog post originated in the 2015 Science Mission Directorate Technology Highlights Report (2 MB PDF). Technology Development: NASA is developing a new instrument to expand the boundaries of astronomy research. A team of scientists and technologists at NASA’s Goddard Space Flight Center (GSFC) is developing the High-Resolution Mid-Infrared Spectrometer (HIRMES)—an innovative instrument that will enable new scientific investigations and important contributions to our understanding of the cosmos. HIRMES' commissioning is anticipated for late 2018 on NASA’s Stratospheric Observatory for Infrared Astronomy (SOFIA), a heavily modified Boeing 747SP that carries a 2.5m-diameter infrared telescope. SOFIA flies above ~95% of the Earth’s atmospheric water vapor, allowing astronomers to gain access to wavelengths that are not possible to observe from the ground, even with the most powerful groundbased telescopes. HIRMES applies emerging detector and optical technologies tailored to take maximum advantage of the unique platform provided by SOFIA, covering the 25–122-micron spectral range with resolving powers ranging from 600 to 100,000. HIRMES will extend proven technologies, striking a balance between pushing the state of the art and providing reliable performance to SOFIA’s growing user community. HIRMES will employ superconducting transition edge sensor (TES)-based bolometers, operating at temperatures of ~0.1 K to provide sensitivity limited only by the intrinsic signal-to-noise ratio imposed by the sky background. These detectors promise an order of magnitude lower noise compared with the heterodyne detectors presently deployed in SOFIA instrumentation, and will decrease observing time by a factor of ~200 on spectral lines of interest. 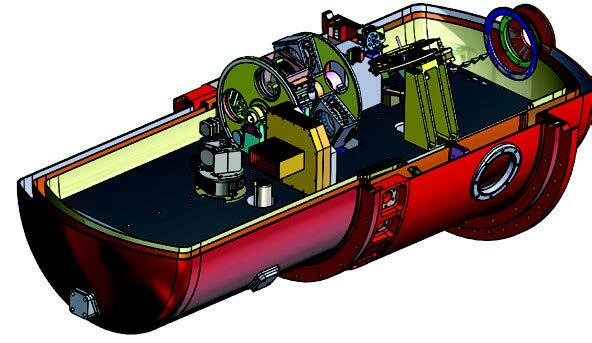 HIRMES detectors will be arrayed in a 16x64-element format to provide low- and medium-resolution spectroscopic observations, including an imaging capability. A separate 8x16-element array optimized for low backgrounds will be used for high-resolving power observations. A multi-stage refrigeration system will provide the ~100mK heat sink needed for background-limited detector performance. Optical dispersion of the light delivered by the telescope will be accomplished via a system of gratings, mirrors, and tunable Fabry-Perot interferometric monochromators. Impact: HIRMES’ prime investigation is a detailed study of the processes leading to the formation of planetary systems over a spectral range rich in ionic, atomic, and molecular lines. The HIRMES science program will determine the structure and evolution of protoplanetary disks and will increase our ability to model these systems as they evolve from homogeneous disks to fledgling planetary systems. At the beginning of their lives, stars significantly interact with their environments and the HIRMES program will advance our understanding about the ways these interactions regulate star formation. The HIRMES team will also study the formation processes of massive protostars and the mechanisms that accelerate dust in asymptotic giant branch (AGB) stars. NASA anticipates significant demand within the scientific community for the powerful new capabilities that HIRMES will provide. Status and Future Plans: The GSFC team developed an instrument concept study in 2016, leading to the competitive selection of HIRMES for development. Work began immediately on development of the instrument, including laboratory evaluation of brassboard subsystems and procurement of limited long-lead hardware items to support an aggressive development schedule. The HIRMES team is working toward a critical design review in FY17, followed by hardware development to enable instrument delivery in late 2018. Sponsoring Organization: HIRMES development is sponsored by the SMD Astrophysics Division in conjunction with the SOFIA Program Office. Dr. Harvey Moseley is the HIRMES Principal Investigator (PI), with GSFC as the lead NASA Center for HIRMES development. SOFIA is managed by NASA’s Ames Research Center and operated out of NASA’s Armstrong Flight Research Center in Palmdale, California.